This project provided HVAC, Plumbing and Electrical Engineering Services for approximately 4,500 gross square feet of renovation to the West Wing 1 of the Lourdes Hospital. 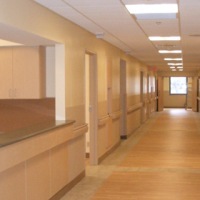 The new program included medical/surgical and hospice with 6 patient rooms and miscellaneous support. The systems design included HVAC, Normal Power, Emergency Power, Lighting, Fire Alarm, Security/Data/Telephone, Nurse Call, Sanitary and Vent and Domestic Water. A new ventilation air system was also required for the project.